A schematic image of acoustic beams emanating from the nacelle of an underwater MHK turbine. Did you know one essential source of clean, renewable energy happens to cover 75% of the planet? What is this massive renewable energy source? You guessed it - water. Marine hydrokinetic (MHK) energy — electricity created from waves, tides, and currents — has the global potential to produce 9,100,000 gigawatt hours annually according to Ocean Energy Systems. 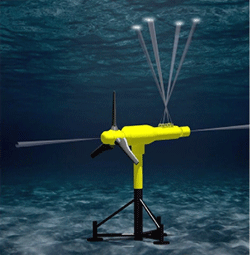 However, marine energy deployment isn’t as simple as placing a turbine underwater anywhere off the coast. Not all sites are created equal, with tidal forces stronger in some areas and weaker in others. For marine energy to progress, developers need to be able to accurately measure the strength of tidal currents to assess the energy potential of a site, as well as the turbulence characteristics to understand the unsteady loads on the device. As part of the ReDAPT (Reliable Data Acquisition Platform for Tidal) consortium funded by the United Kingdom's Energy Technologies Institute, the University of Edinburgh in Scotland has explored precise and efficient means of measuring the energy potential of marine energy sites. While conducting experiments using acoustic Doppler Profilers, researchers at the University of Edinburgh experimented with a new convergent-beam technique that could increase the accuracy of measuring tidal currents around an MHK device. PNNL recently teamed up with the University of Edinburgh, as part of a project sponsored by the U.S. Department of Energy’s Wind and Water Power Program, to support these sub-sea experiments by interpreting and analyzing the acoustic measurements. The result of the project was an adjusted measurement tool, a convergent-beam acoustic Doppler profiler configuration (C-ADP). The use of acoustic Doppler profilers is common in characterizing the bulk flow of tidal currents, with the configuration emanating acoustic pulses away from a single instrument in a diverging beam arrangement. Each beam retrieves information about the flow speed, and collective information from a number of beams allows a three dimensional flow velocity to be calculated. However, the wide sample area captured by the divergent technique results in a relatively low spatial resolution measurement in the horizontal plane. The C-ADP is a modification of the acoustic beam. Using multiple converging instruments, the acoustic pulses cross one another through a central focal point, increasing the spatial resolution of the three-dimensional velocity measurement.